2009 is a special year for Seán Ó Sé, the celebrated Cork singer. It marks the Golden Jubilee of his singing debut way back in 1959. In the intervening 50 years he has certainly made his mark in Irish Traditional singing. He is best known for his collaboration with Seán Riada in the 1960s which began with the recording of their legendary version of An Poc ar Buile. He is featured on many of Riada’s recordings, including Ó Riada sa Gaiety and the soundtracks of Rhapsody of a River and Kennedy’s Ireland. His solo albums include Heritage, The Banks of My Own Lovely Lee and The Green Road with the famed Turloughmore Céilí Band. This is his second Canadian visit with Comhaltas and his fourth in all to North America. Pádraig is a renowned uilleann piper from historic Boolavogue in Co. Wexford. He also plays flute and administers the Comhaltas Archive in the Father Murphy Centre, Boolavogue. Pádraig has participated in many Comhaltas Concert Tours down through the years including Ireland in 2004, Britain in 2005 and North America in 1987 & 2005. Clare from Tipperary is a is a highly talented young fiddle player and took the All-Ireland title for Slow Air playing at the 2004 Fleadh Cheol na hÉireann. A member of the internationally acclaimed Brú Ború group she performs regularly at the Centre in Cashel. She also tours with the group having performed with them in Japan, China, Slovenia, France and the USA. Clare also travelled to America as part of the Comhaltas 2005 Echoes of Erin Tour. James, who comes from County Kerry, has been a prizewinner on fiddle at many Fleadhanna events at County, Provincial and All-Ireland level. He has performed on Tours in both France and Spain with the University of Cork (UCC) Traditional Music Society. 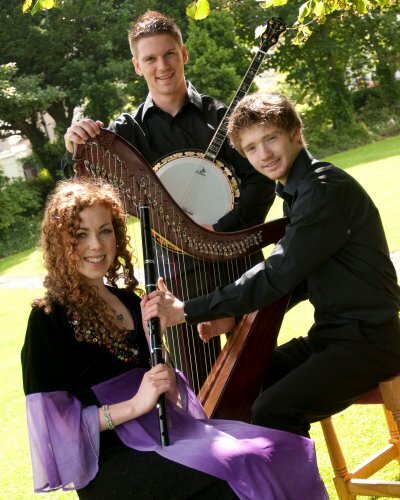 James has also performed with Siamsa Tíre – Tralee and is Youth Officer with Kerry Comhaltas. He is also a member of UCC Trad Society Committee, Féile Lios Tuathail and Producer of the Seisiún in Listowel for a number of years. Aisling, who hails from the hallowed ground of traditional music in East Clare, is both a talented musician and dancer. She is currently studying Irish Music and Dance in UL and featured amongst the prize-winners at this year’s All-Ireland Fleadh in Tullamore in the senior concertina competition. 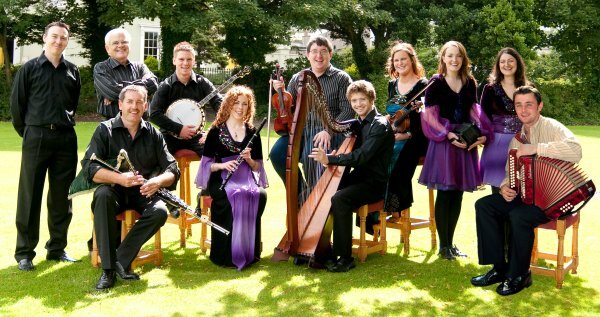 Aisling has performed overseas at Festival Interceltique – Lorient 2007 and also with Brú Ború during their trip to Shanghai in 2008. She comes from a very musical family and her mother, Paula McMahon, is well known as a music teacher and Producer of the 2008 East Clare Seisiún in which Aisling also performed. Christina Dolphin is a great young Dublin flute player who belies her age by her achievements on the Irish traditional music scene. A prize winner at numerous All Ireland Fleadh Cheoil competitions on both flute and whistle, Christina has also taught at Summer schools including the famed NYAH festival in Cavan. She has toured overseas with Comhaltas and has been a performer with the Dublin Seisiún group at Cultúrlann na hÉireann in Monkstown for many years. Óisín is a Dubliner who plays both harp and Flute. He excelled at the 2008 Meitheal Summer School and was the Course nomination for a place on the Comhaltas Tour of Ireland. Óisín was also a member of the group who took first place in the All-Ireland finals of the 2007 Siansa Gael Linn competition. In 2008 he was a member of the Dublin Seisiún group who performed for the Cultúrlann na hÉireann shows in Monkstown. Eoin, from County Limerick, is a talented young banjo player who has won County and Munster Medals on the instrument. He also attained runner-up status in the 2006 All-Ireland Fleadh in Letterkenny and was a member of the Tuar na Fola All Ireland winning Group. Eoin toured throughout England, Scotland and Wales during February 2009 with the Comhaltas Echoes of Erin group. Darren hails from County Fermanagh and is renowned for his unique style on the accordion. The 2008 All-Ireland Senior Accordion winner at Fleadh Cheoil na hÉireann in Tullamore, Darren is just as much at home playing in a street session or one of the many Summer music festivals. He’s a regular performer each year at the Eddie Duffy / Mick Hoy festival in Derrygonnelly. See and hear Darren on Comhaltaslive. Also look out for his first CD released in 2008 which highlights his personal style and has attracted wide acclaim in traditional music circles. A former pupil of the of the Flemming School of Dancing (Tipperary) Séamus O’ Rourke is a regular performer with the All-Ireland winning Teampall A’Ghleanntáin Comhaltas Pléaracha Show. In addition to being a top-class step-dancer, Séamus is a very highly accomplished set and céilí dancer and has been a member of various award winning groups in Tipperary and East Limerick. Séamus has toured abroad previously and dances regularly with Thersa Sheehan as a member of the Teampall A’Ghleanntáin Seisiún Group. Séamus also teaches dancing on a regular basis. Theresa Sheehan was a member of Leeds CCÉ before her family moved to Templeglantine in West Limerick. Although a champion step-dancer Theresa first came to national prominence as one of Donnachadh Ó Muineacháin’s demonstration dancers for the CCÉ video on Ceili Dancing “Beirt Eile” having danced with Donnchadh and David Rea at the Munster Fleadh Cheoil na hÉireann concert that celebrated the fiftieth anniversary of CCÉ. Theresa has been dancing with the local Seisiún show in Templeglantine and also with the branch Pléaracha and Scoraíocht shows for many years.